Metal recyclers have called on the European Commission to cut unnecessary red tape in its revised circular economy (CE) package. The British Metals Recycling Association (BMRA) made the recommendation as it outlined its five main priorities to the Commission, including ambitious recycling targets, which it said are necessary to increase investment in the sector. The Commission’s revised CE package is due to be released this autumn after the original package was dropped last December, included recycling targets of 70% for municipal waste and 80% for packaging by 2030. Two public consultations are currently running to feed into the revised CE package, with one specifically focused on waste markets. 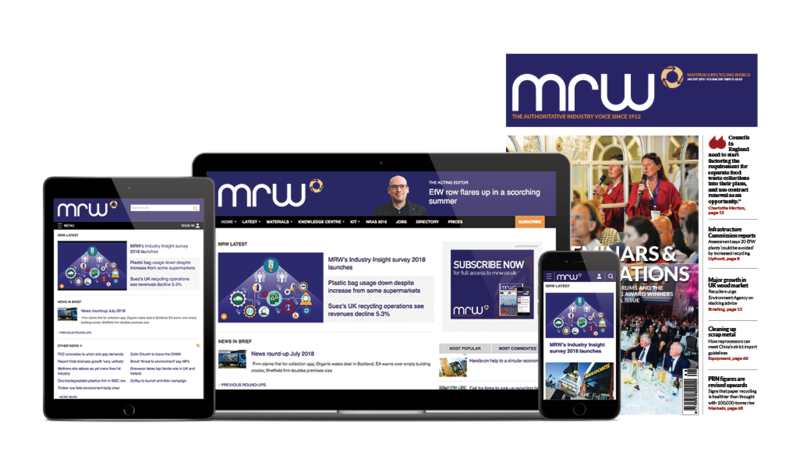 As the broader consultation draws to a close, BMRA director Ian Hetherington (left) explains the Association’s priorities in the next issue of MRW, including the call for the Commission and national governments to cut red tape. The Government is currently running its own Cutting Red Tape consultation with the waste sector one of five key industry areas subject to the review. The BMRA also called for the Commission to ban landfilling of recyclables and phase out incineration of unsorted wastes. Hetherington said: “Despite the introduction of the Landfill Directive, tonnes of materials with valuable fractions are lost when they could have been recycled. He also outlined the need for better pull mechanisms to drive demand for secondary materials, that factor in environmental benefits.